As HTC’s newest basic mobile, does it have anything good? HTC is spreading its wings. When its hi-end smartphone lies among the best Android ones for relative prices, the brand also aims at mid and low segments. Desire C is the latest basic phone from HTC and no-SIM version costs only $270. It’s interesting that this phone is not a budget model that HTC has decided to give the name “Desire”. Few years ago, the brand did release original Desire and Desire HD. Now, this name has been given to a basic model from which HTC may think they will gain some glories. Of course, this phone has some upsides. First is Android 4 Ice Cream Sandwich (at present when mobiles costing around $300 all run on Android 2.3), which is the most appealing factor. This phone’s design looks attractive, too and it’s not a “brick” plus regular in shape. Back rubber finish is black/white and easily handled, with elegant curves. Removing the back lid, we can see dark red color inside. Despite being eye-catching, it is unnecessary thing that we still like. It proves the brand’s daring to think and do and an exciting feeling. We can see dark red color inside. There’s 4GB storage plus 2GB micro-SD card in our tested model. Like recent HTC’s phones, this mobile provides users with free 25GB storage in Dropbox for 2 years. 2 years later, you will probably change your phone. NFC is also surprisingly included when it hasn’t really caught on by any meaning; it is good to make a preparation for the future. 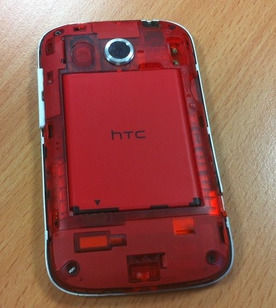 We could hear creaking sounds which considerably decreased HTC Desire C’s appeal. It’s vulnerable for a small mobile that the display’s size is reduced down to 3.5 inches. On good side, this enable user to control the phone with only one hand. However, low resolution (480x320pixel) results in difficulty for users who regularly browse webs and get along with multimedia. Keyboard is a bit crammed and we did find problem typing accurately. The screen is 3.5inch sized, plus 480x320 pixel resolution. Audio power is below standard. Despite support from HTC Beats Audio but, in fact, our tested model’s audio quality was really poor, with many treble outputs via speakers and headphones, which came as a pity. HTC picked 600MHz processor and it is a real problem that Desire C has to face. It seems weak in all aspects. We had to wait for apps to start many times and if you consider finding faster processors in this price range (or even lower one), we will not be impressed. Battery runtime is another problem. We succeeded in experiencing the phone one day with only one recharge but we did expect more than that – maybe one day and a half – in such a small-screen device. Runtime might not be a spoilsport yet it was another downside, we were afraid. 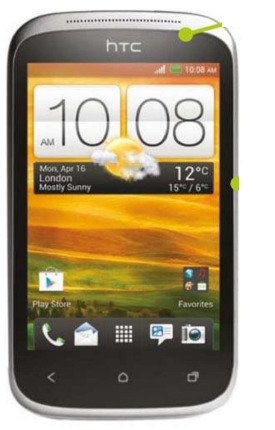 Overall HTC Desire C disappointed us and we hoped for better mobiles in similar or lower price range. Alternatives are Orange San Diego and Huawei G300 (plus 1GHz processor). In two cases, you will have to compromise Android’s versions but receive benefits in most aspects. It’s wise to look for specific details. Hand-friendliness: The monitor may be small but it’s good for hands that are small, too. Ice Cream Sandwich: If you prefer a budget ICS model, this is your cheapest one. Though, you’ll need to make further difficult compromise. Red color: Remove the back lid and interiors, you will see all red. NFC: Cheap as it is, this device still owns NFC. Dropbox’s support: 4GB storage appears small yet you have micro-SD slot and 2GB cloud storage on Dropbox. Mobile ability: The phone is tiny and light, perfect for small pockets. Android: The latest Android version, Ice Cream Sandwich, is included. NFC: NFC, which is due to grow faster, is also integrated. Storage: You have 25GB cloud storage on Dropbox plus 4GB internal memory. Runtime is averagely one day, a little disappointing. 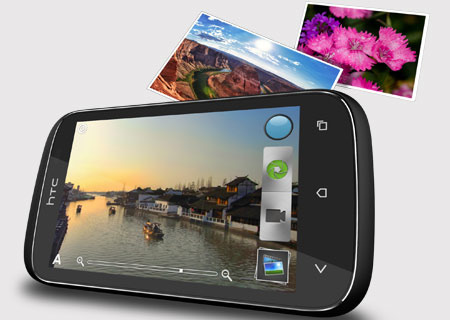 Performance is limited by slow processor but HTC will enhance it. The phone is good-looking with some nice spots. There are some surprises, NFC for example, but it is truly weak according to specs. The market’s budget segment has several competitive models. Let’s look around! ICS and NFC are considerably upsides on a budget smartphone but Desire C feels limited in some aspects.